I live alone in a single family house in a suburb near a large city. I awoke at 2:35 a.m. (PST) on Wednesday, August 17, 2011; left my bedroom (which is a guest room since the temperature in the summer is cooler than the master bedroom); walked down the dark hallway (faintly illuminated by glow of bug zapper down hall used for killing moths from bird seed); entered master bedroom; shut the door behind me (except for a crack); and I could see motion in the dark hallway that looked as if someone walked up to the door and was peering at me. Afraid to face the possibility someone was in the house, and knowing the house was bolted down like a fortress (with deadbolts, “hotel bolts,” and shatter-resistant multi-pane windows), I used the restroom without turning on the lights. I then cautiously entered the hall and nobody was there, but down the hall, a bright fuzzy white light shined through cracks in locked room. I thought to myself, could it be the bright white energy saving front porch light that has over 100 watts of output? However, as I stared at the illumination surrounding the door and emitting through its threshold, it quickly faded out, leaving the faint illumination from the porch light as I then recalled was always the case. (The mating of the door and threshold was so tight even the bright white light coming through the threshold was non-existent except in a few places, and the light that did get through was faint.) I immediately realized someone was in that room, shining a bright light that must have been an LED or HID light due to its intensity. After pausing for a moment to think, I decided to quickly throw open the door and face whoever was there. When I did, the room was empty. 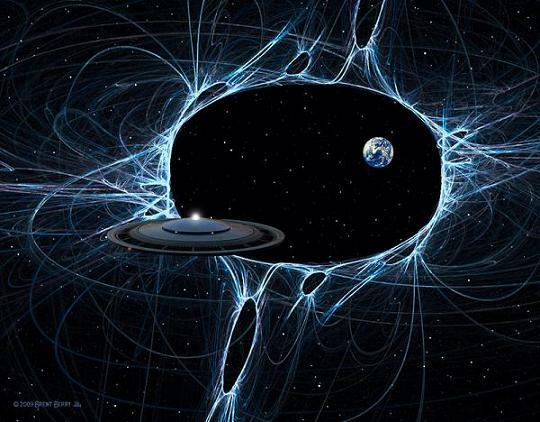 I recall getting waves of goose bumps all over my body because I knew something unexplainable had occurred. Whoever was in the hallway was the one who disappeared in that room, I was certain of it. 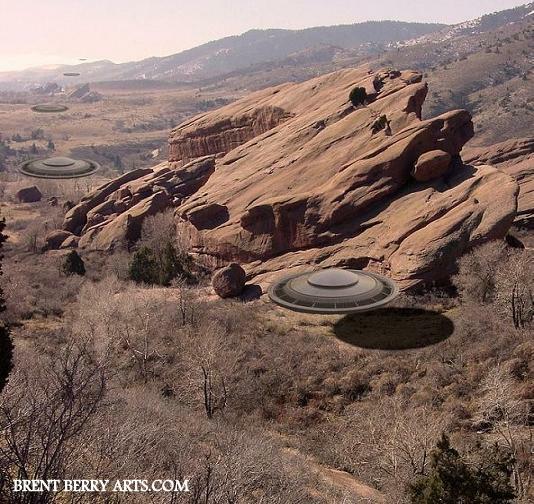 As a little history, my family and I have had UFO visitations my entire life, with unusual activity in the homes where I grew up (i.e. time distortions with clocks off in every room, objects hurling across a room for no apparent cause, and other inexplicable phenomenon beyond the scope of this report). In the mid-1990’s in my parents’ home I awoke to see a young man in his 20’s wearing military fatigues and a helmet standing at the foot of my bed staring at me. At the blink of an eye he was gone. For some strange reason, my immediate thought when this event occurred was that man was in my hallway, although I cannot explain why I sensed it was him again. As a side note I felt in no danger. My imagination ran wild for a moment in speculating who it was or why they were in my house and how they disappeared; was it a time traveler? An E.T.? I’m afraid if they return and I open the door before they disappear into that white light, what will happen if I confront them? These are my observations to the best of my recollection. 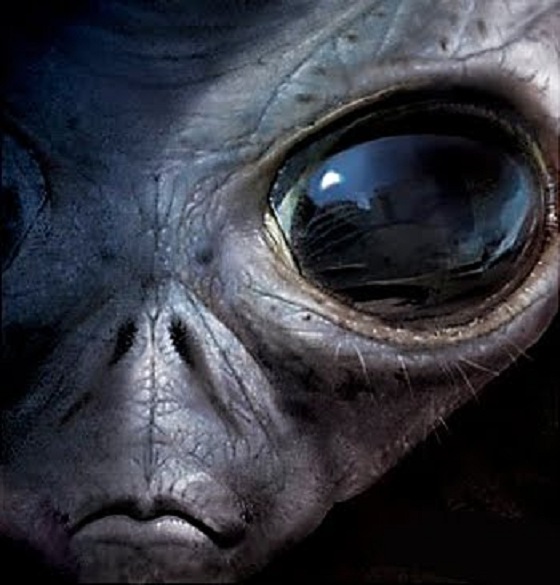 KENS NOTE: Many Ufologist are trying to link UFO encounters with the paranormal. Anything as possible. Shortly after returning from work here in Italy, 4 aircraft mechanics witnessed a triangle craft or 3 separate crafts fly over our hotel at 12:51 AM. The triangle was transparent as we could see stars from the big dipper through the triangle shape. The triangle passed over the hotel and through the big dipper heading north in a straight line, then it banked to the left and shot out of sight heading in a north west direction. We observed this triangle for approximately 10 seconds. My account is that it is 3 separate lights that make up the triangle, but they fly as if they are one object. 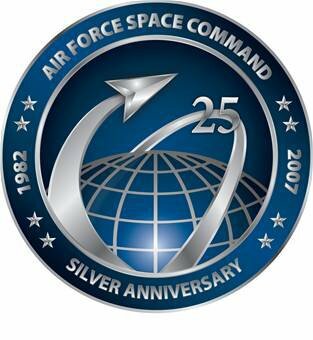 Having been in the Airforce for 15 years, I have never seen anything that could fly like or resemble this shape. NOTE: The above image is a rendering. My brother, a friend and myself were on the front porch when I looked to the east and noticed something that seemed completely out of place. It was brighter than a star or a planet and it seemed to be pulsating and hovering. Commercial aircraft flies overhead regularly and it was much larger and higher altitude. I brought it to my brother and friend’s attention and we began watching it closely. It seemed to drift and then hover and then pulse. 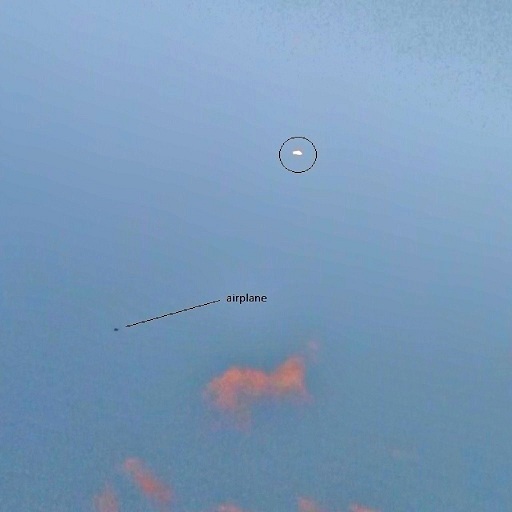 When it was obvious that it wasn’t a plane or a planet(I used my Skyview iPhone application to debunk any planets around or visible… there weren’t any visible in that area) we went and got our binoculars and realized it had a specific shape. 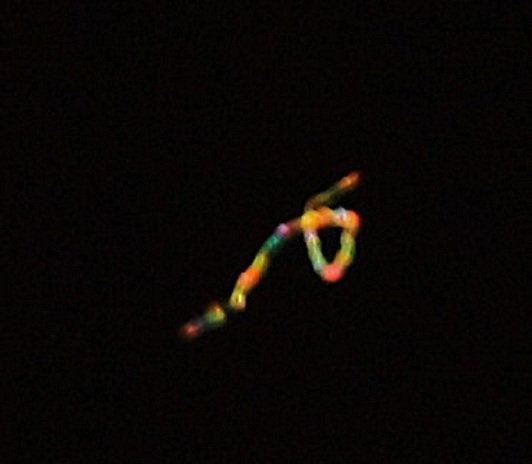 A triangular shape with at least 3-5 distinct circular orb like shapes at each point with what looked like electrical current running between all the points. I began taking zoomed in pictures with my iPhone and then grabbed my expensive zoom lens Canon camera and rapidly took about 302 photographs. For some reason my cell phone battery went from 88% to 18% within a matter of 15 minutes. This also affected my friend’s cell phone battery power as well. 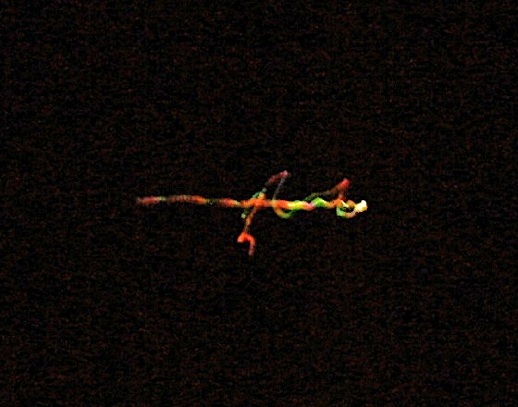 It increased in size and rapidly pulsed and while I was watching it thru the binoculars it seemed like 3 other craft split from the center leaving the original object less pulsating and only white light… the other three objects had the spectrum of light in a pattern and were darting to various points and hovering with the colored lights pulsating in a pattered around each craft. The shape of the original object seemed to change as well and become more of a disk like shape. 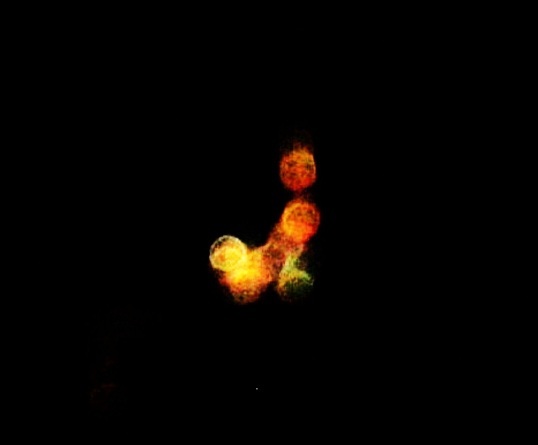 The other 3 objects with colored lights were boomerang shaped. We drove at least 20 miles east to Rockwall, Texas’s Lake Ray Hubbard. We parked and continued to watch the objects but they decreased in size and weren’t pulsating as much as before. By5:30am they seemed to be gone. NOTE: These photo were enlarged and cropped from the high definition photos taken by the witness. Thanks to MUFON and their CMS system. My husband and I were surf-fishing off Cocoa Beach, FL around 1 o’clock in the morning. We had separated from one another by about 25 yards…far enough that we couldn’t hear each other over the waves. I was just about to cast into the surf when I saw something flying slowly above over my right shoulder. It was a bright green, fuzzy ball of light flying overhead from the land towards the water. It flew above and between my husband and I keeping the same height and speed…about 10-20mph. It just kept flying out over the water until it disappeared into the distance. I started walking back towards our bait bucket thinking about what the hell I just saw. By the time I reached the bait bucket on the beach I had convinced myself I was seeing things. But I knew I HAD seen something because this sighting lasted long enough to question myself about what it was I saw. My husband had walked back too and the first thing out of his mouth was “Did you see that bright green fuzzy light?! 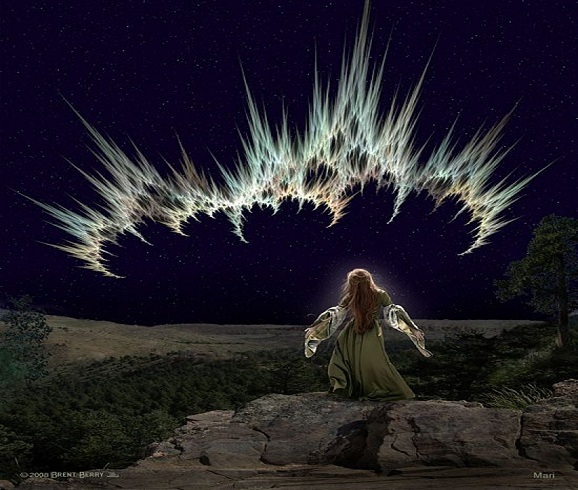 ?” I was so relieved he had seen it too, although it would have been impossible for him not to see it because it was close, flying slow and it was the middle of the night and was the brightest thing in the sky. We have no idea what it was and we still talk about it to this day. 6 PM..As we turned into Appelblaar street in Glenmarias we noticed two bright orange lights moving along a flight path from ORT ambo Airport. One disappeared from view the other flew right in front of an aircraft taking off. We gave chase driving along Dann Road but it was difficult to follow as we got held up at traffic lights and the object was obscured by the tree line. The craft disappeared as if it landed. We then drove back along Dann Rd to Woodbridge Square. From the FNB Bank we watched the second orange orb float silently overhead. We stood and looked right up into the craft. It was very exciting and was torn between taking my eye of the craft and setting up the video on my cell phone. In the end I managed to get two photos as it disappeared behind Woolworths. As it flew over the building it dimmed a bit and then it lit up again. This was a true case of a unidentified flying object as neither of us had seen anything like it before or imagined a ‘flying saucer’ to look like this. It looked a bit like a big orange ball of gaseous jellyfish. I went to meet my friend at his house after a soccer game at about noon on a Sunday. It was a nice clear and warm day so I went out on his patio at the back of the house to wait for him. The patio looks over the canal and the mountains on the other side of the water. I noticed what I thought was a flock of birds over the water but then quickly realized they were too far away to be birds. I thought maybe they were planes but they didn’t look like planes or make any sound. 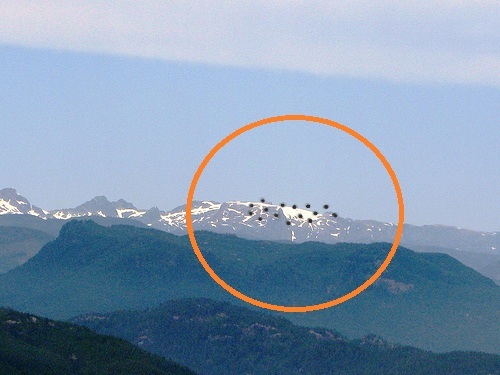 Their were about 15 objects that were against the green mountains and then they went in front of the snow caps on the mountains and I could tell they weren’t planes or helicopters or birds, they were just solid objects that made no sound. I watched them for as long as I could and then they were out of my site. They would have been travelling North towards Mt Klitsa. I’ve attached a photo of what I saw looking against the snow cap mountains. I had two sightings in my life span, but the most intriguing and the most memorable one was in the year 1983. I live in Larnaca, Cyprus. Larnaca is found on the south coast of Cyprus just above the Middle East and Africa. It was during the last year of High School. It was towards graduation time which wouldmean the end of May. My school is situated very near the salt lake and there are small hills all around. Cyprus from May on wards has hot weather so all class windows were wide open. 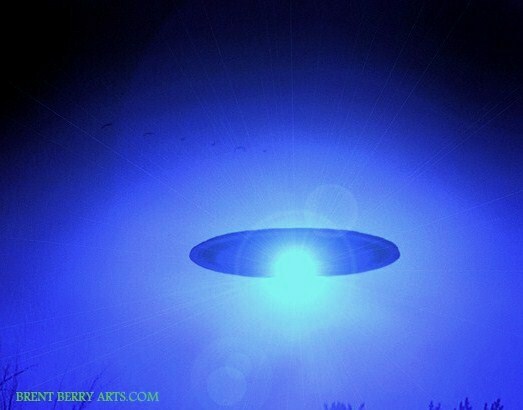 Suddenly my attention was drawn by a very bright, shiny silver object that was hovering above a hill of 6 meters high. For a few minutes I thought I was hallucinating and was trying to determine whether it was caused due to the brightness of the sun. The object was not round as a saucer. It was more of an oval shape and it covered the whole perimeter of the hill if not bigger than that. Suddenly it moved sideways and hovered again. Let me say at this point that the salt lake is between my school and Larnaca Intl Airport. My teacher having realized my attention was drawn elsewhere, outside the window she reprimanded me for not paying attention to my lesson. I explained there was something unusual outside and we all gathered at our classroom balcony. My class was on the second floor. The object moved again towards the opposite side of the hill, hovered once more for several minutes. It moved a third time seemingly on top of the hill but not exactly. Very slowly it started to move downwards behind the hill. It remained hidden a few minutes and re-appeared. It hovered for a couple of minutes as if preparing for take off. lightning. The UFO disappeared within the blink of an eye. I hope my description is clear enough. I hope to hear from you in the not very distant future preferably through chat. On July 20, at 12:46 PM, my friend Scott passed on this photo to me. He was doing a BBQ with friends and family at his home in Brierley Hill, West Midlands, UK. The weather wasn’t the best really, but they they persisted to enjoy the BBQ. There was a loud roar in the sky and instinctively people looked up. 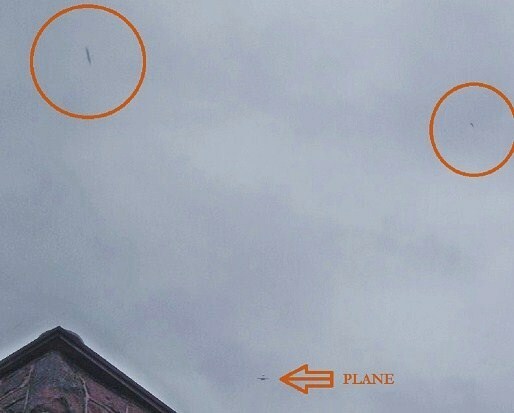 There was a plane overhead which they noticed seemed to be being tailed or flanked by at least two strange, elongated objects. 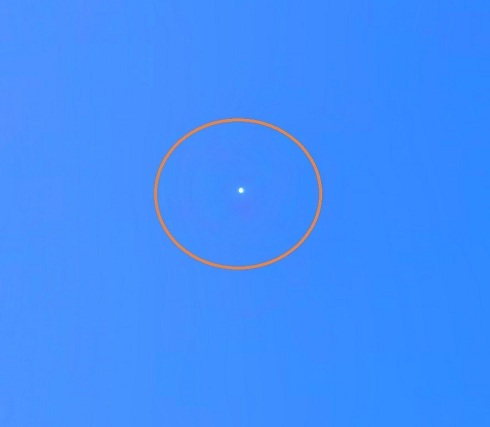 The UFOs (I use the word because they were flying, they were objects, and they definitely were unidentified) were closing in on the plane, then retreating a couple of miles back in a matter of seconds! I find it interesting how the three seem to be in a near perfect triangular formation, maybe they were working together? Now Scott isn’t the type of person who believes in paranormal activity, he’s the ‘old school’ set in his ways kind of person who believes black is black and white is white, to him I think its fair to say there’s no ‘grey’ area. He knows that I, on the other hand, am interested in all things unusual, so he emailed me these photos (attached) and report. I would like to say that this must have been quite something for Scott to grab his family camera and start taking photos! More people took photos with their cameras and phones which I can chase down for you if desired, the whole thing only lasted around a minute and the plane and objects disappeared over the house. Scott is 57 years of age and an experienced man of the world, he also says this incident has swayed him to thinking there just may be something else out there other than just ‘us.’ His camera is a FUJIFILM AV150 14 Mega pixel. Please let me know what you think of this. Col Foster. THREE ALIENS SPOTTED IN THE ” DEVILS CANYON ”. CLOSE ENCOUNTER IN THE ” DEVIL’S CANYON ” OF HUNTER NEW YORK. end. The entire craft was about 12′ top to bottom. I spent about 15 to 20 min. 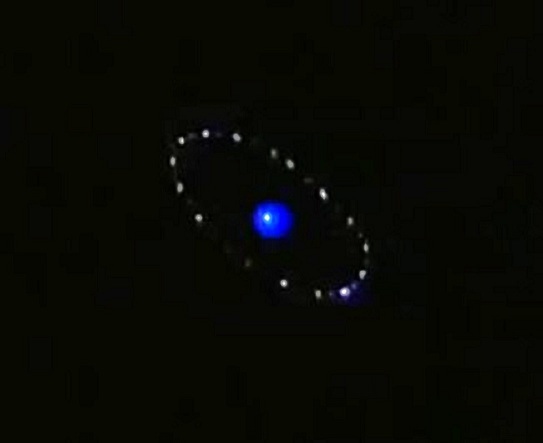 Unusual circular lights hovered over the city of Yucca Valley, California for 10 minutes on July 21, 2011 from 10:33 PM until 10:43 PM. 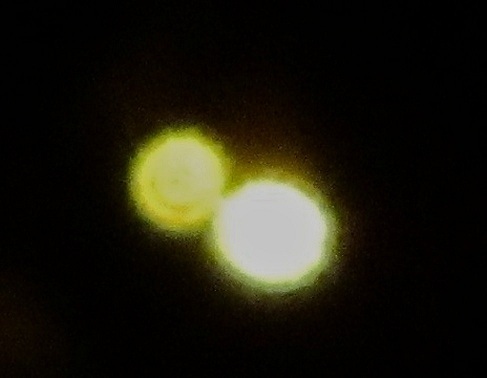 In a dark desert sky, the glowing orbs remained at approximately the same altitude the entire time they were visible. It appeared as though they were slightly moving to align with each other. 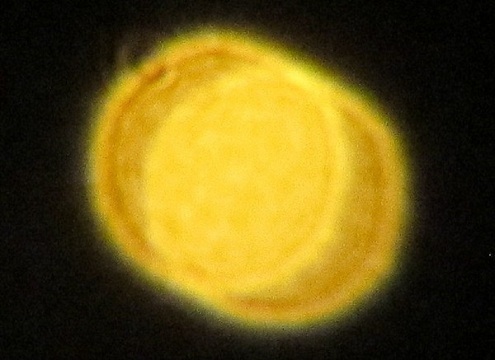 These unidentified reddish-orange orbs conjured up images of the 1997 “Phoenix Lights” sighting although they appeared in a different configuration. 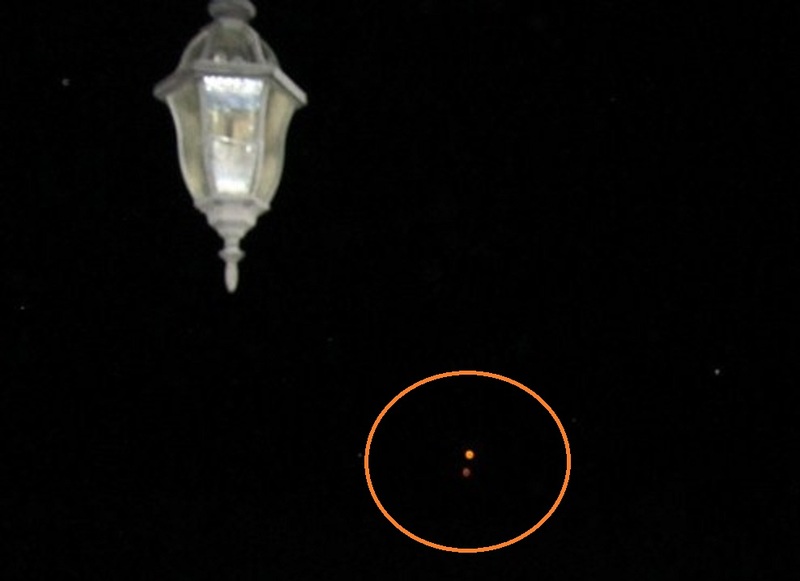 The glowing lights with a reddish outline appeared oval in shape at one point, just before they finally lined up. 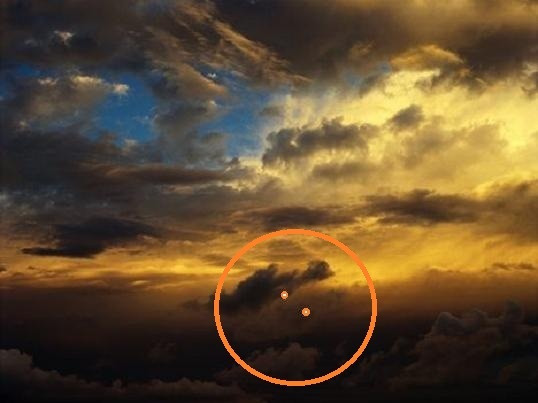 The remaining circle brightly glowed in the sky and then disappeared into the darkness of the night. 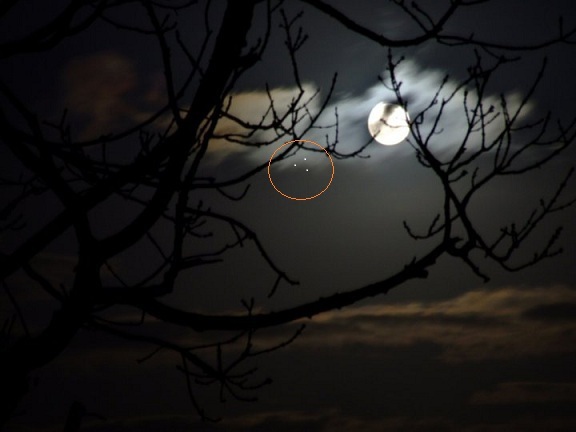 The writer of this article personally observed and photographed this sighting. The writer is not a UFO enthusiast and attempted to decipher a scientific explanation for what she witnessed. The author’s calls to local authorities and military officials were not returned. Special thanks to Julia Davis from the L.A. Examiner. in the center. There were no blinking lights. was further away and that’s when I snapped the picture. Note: The above image is a rendering. missile sites near Cheyenne, Wyoming, in the fall of 1976.
first nine years I served as an enlisted man and the last 11 as an officer. south about 9 or 10 miles from the Launch Control Facility or LCF. the vehicle, look around and report anything that the saw that looked unusual. He gave no hints about where to look or what to look for. white thing in the sky. north about 10 miles and that it looked very close to the main capsule. conversation he just had with the SAT. mentioned the object and received some chuckles and ridicule. would wake the base commander. I wish we had. talking to him and trying to calm him down. activity. I did not see Sgt Jones again on any other alert duty. reservations about mentioning this incident.